Your not going to miss the 1 p.m. game because it’s due or die. New Haven controls their own destiny whether they will play in tomorrow’s Class 1 State Championship match or for in the third place game. 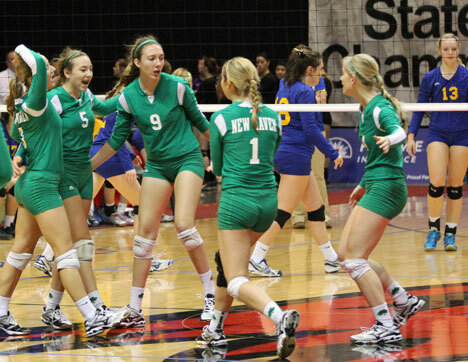 If New Haven wins both sets against Winona then they are in tomorrow’s state title game regardless of the outcome of St. Vincent/Santa Fe game. However, If New Haven and Winona would split sets and St. Vincent wins both sets then it would be Winona in the State Title game. Things could really get crazy if New Haven and Winona would split sets and St. Vincent and Santa Fe would split sets. Then it would come down to points.